Back when I thought I could eat gluten I was a biscuit hound. It was nothing for me to scarf down two or three. I have been known to forgo the rest of dinner for a good biscuit. I always considered myself a connoisseur, from angel biscuits to crescents or buttermilk to sweet potato I think I have made them all. Some of them were more fussy to make then others and all always in need of a light hand and a quick touch to keep them from being tough. This biscuit is what I call a redneck biscuit and I call them this with fondness. They are a working mom’s weeknight biscuit. They come together quickly and without worry and they lack nothing other then fussiness. There is nothing in the instructions about overworking the dough, you don’t need to look for a cornmeal texture in the flour, there is nothing about spacing the biscuits perfectly or about flakiness or making sure you cut the edges cleanly for a good rise. No they are pretty much cream, add the liquid, stir and scoop. They are inspired by Shirley Coriher’s Touch-of-Grace biscuits which I started making just before I found out I couldn’t eat gluten. 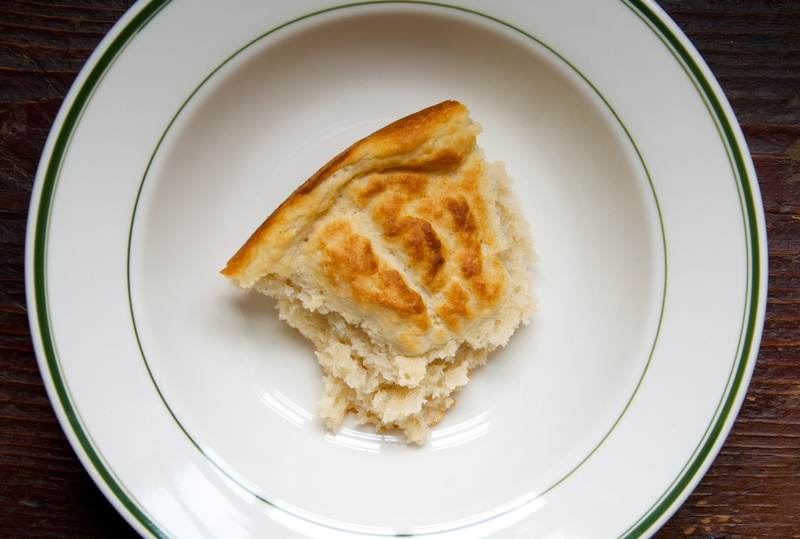 They are the kind of biscuits that are gooey in the middle, they aren’t layered but are tender and airy. They are the kind of biscuit you might find at a really good diner. You can imagine this old dogs disappointment when I had to stop eating them. The thing is about 4 months ago I started playing around with and making gluten-free biscuits. While I found many I liked, I went nuts for none. Then I got a burr up my craw and decided I wanted to make Shirley’s biscuits but gluten-free. It wasn’t all that tough, or I should say, maybe I got lucky. I found a recipe on Bob’s Redmill and, using it as a base and replicating what I knew about Mrs. Coriher’s biscuits, well, low and behold I struck biscuit gold. In all honesty I like the flavor of this biscuit better then the original. The sorghum flour has such a great flavor. One of the big bonus’s if there are any left, which is a rarity around here, is they hold well into the next day or two. 1. 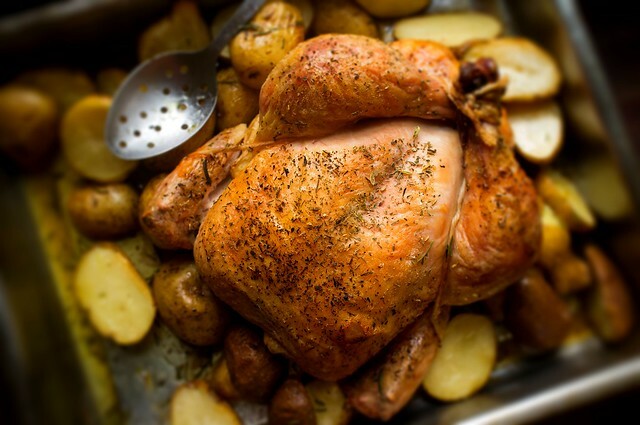 Heat the oven to 450˚F. 2. In a bowl combine the dry ingredients. 3. Cube the butter and add it to the flour. Using your hands work it into the flour until there are no big hunks of butter left. 4. Add the buttermilk and stir with a wooden spoon, The batter will be very loose, it should barely hold its shape before slowly begins spreading. 5. Liberally butter an eight inch cake pan. Using a half cup ice cream scoop, scoop up a ball of dough and turn it out into the pan close to the edge. Continue turning out biscuits working your way around the outside first leaving room for the seventh and final biscuit in the middle. 6. 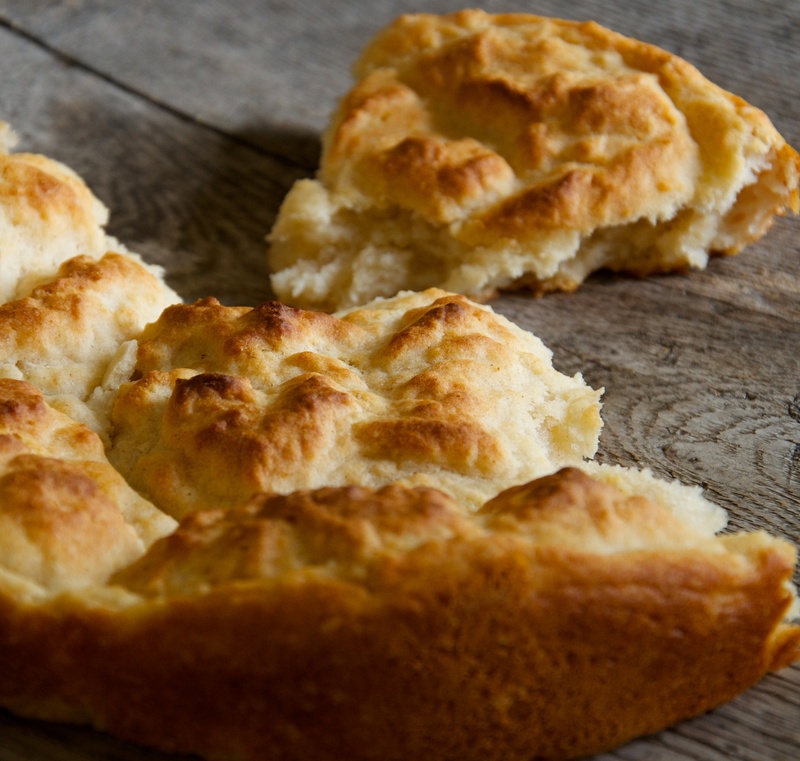 Bake the biscuits for 23 minutes or until browned on top. When you remove them from the oven they will drop. That is OK.
7. Serve with lots of butter.